Solarize is Back! 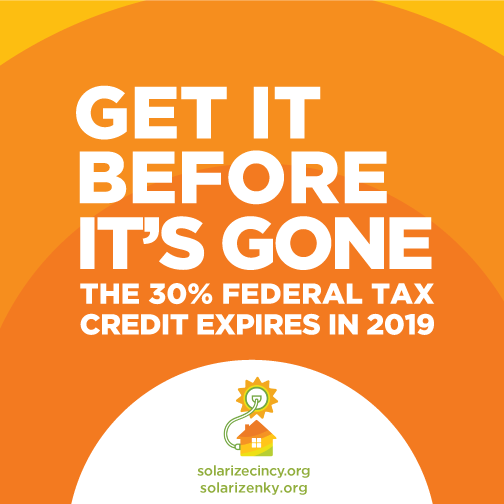 This year is your last opportunity to take advantage of the 30% Federal Tax Credit and the Solarize discount. Springfield Township is partnering with the Greater Cincinnati Energy Alliance (GCEA) to make the process of installing solar simple and more affordable. GCEA is a nonprofit dedicated to helping Greater Cincinnati communities reduce their energy costs through energy efficiency and renewable energy. Visit www.solarizecincy.org to sign-up for a free assessment or register for one of the workshops to learn more. If your home is a good fit, Solarize will connect you with a qualified installer who can develop a free proposal for your consideration.